This entry was posted in Recovery, Success Story on September 20, 2017 by ATMC Team. I totally love this program! It is so wonderful to feel like the way I did when I was a young kid again. Never have I felt as great as I do right now, ever in my whole life before this. The program is incredibly unique. 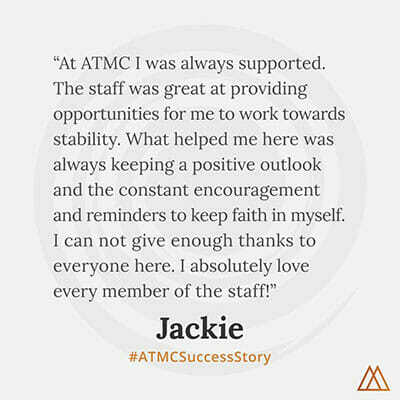 The ATMC staff is spectacular and they genuinely care about each and every client. What also makes this so great for me is the fact that almost every person on the staff is also in one phase or another of their own recovery. This means that they have experienced and lived on both sides. I feel euphoric about how clear my mind is. I am thoroughly enjoying the experience of my sensitive senses which are newly heightened. My life has undergone a total turnaround from past self-destructive, life-ending, and negative ways of life to new ways in life where I feel optimistic and I am really striving to help others. Thank you to everyone who has helped me to get onto this path to my new life. Especially I want to thank the all of the staff for saving my life and for never, ever giving up on me.